The launch of Newsham Community Matters project. 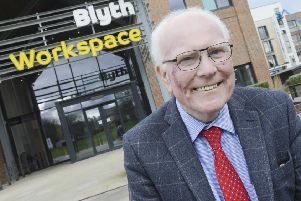 A new community project has been launched to help improve the lives of people living in part of Blyth. After a series of anti-social behaviour incidents in Newsham, Northumberland County Council and Northumbria Police carried out a door-to-door survey to find out the main issues and what residents wanted to see. More than 300 households responded, and a new ‘Newsham Community Matters’ project has been launched, supported by the council with £25,000 funding from NE Procurement. A Community Interest Company, led by tenants and residents, will be formed to take the project forward. The scheme will offer residents activities and courses to help improve their lives with focus on three themes – IT Matters; Practical Matters; and Family Matters. Courses will be held at the Church of Yahweh, St Bede’s Church Hall and The Pavillion, starting on Tuesday, March 21. A free family fun day to launch the project will be held at The Pavillion on Saturday between 10am and 2pm. There will be a children’s parade, Princess and Pirate fancy dress, treasure hunt, raffles and the chance to find out more. Coun Alan Hepple, cabinet member for housing, said: “This community project will help residents to gain new life skills, as well as potentially improving their employability and general health. Irene Willis, 72, has lived in Newsham for more than 50 years, said: “I have seen a lot of changes over the years, but recently we seem to have lost that community pride in the area. “This project has so many different elements to it that I think there is something for everyone. Working together, and getting the older generation to help the younger one, will hopefully not only improve the community but also the lives of people who live here. Other partners involved in the project are Northumbria Police, Community Voluntary Action Blyth Valley (CVABV), Silx Employability Project, Northern Learning Trust, the Army, Northumbria NHS Healthcare Trust, British Red Cross, Northumberland Fire and Rescue Service, Sure Start and Blyth Spartans, who, along with volunteers from the community, will deliver courses and activity sessions. Leaflets and posters giving further details of the project and the family fun day will be going out in the community this week. For more information on courses call 07552260613 or like the Newsham Community Matters page on Facebook.